Our rich business expertise enables us to speak the same language with customers and understand their business needs easily. We engage with our Clients in various flexible models viz., Onsite, Offshore, Near-Site and Hybrid model depending on the convenience and needs of our Clients. Cherrytec offers flexible pricing models designed to meet the diverse project needs regardless of the duration (short time-span or long term) or size while engaging numerous resources. While our pricing models offer you the freedom to choose accordingly for a specific project, we assure cost effectiveness of every model. 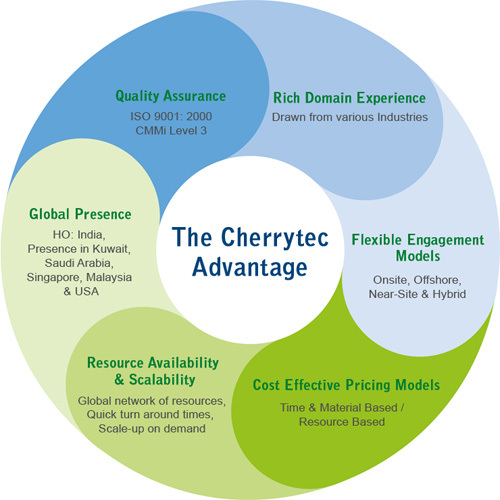 Cherrytec offers Time & Material (T&M) based pricing, resource-based pricing or lump-sum project based pricing. Cherrytec has a good team of technical and functional consultants, programmers, team leaders, project managers, system engineers, subject matter experts, database consultants, system architects. These resources can be made readily available for a project on quick notice. Cherrytec also has the capability to scale-up the team size for larger projects through its global network of resources. Cherrytec’s Technology Focus Group(TFG) has a close watch on new and emerging technologies; identifying the potential of offering such technologies to our Clients and constantly building up or training our internal resources on such technologies. With its Head Office located in Chennai, India and presence in countries such as Kuwait, Saudi Arabia, Singapore and Malaysia, Cherrytec is fully equipped to service Clients in and around the region for executing Onsite projects or from our state of the art offshore facility. Cherrytec covers a wide spectrum of technologies in the ERP and Applications space on various databases and Operating Systems. We also focus on latest technology trends and quickly adapt ourselves to offer services in the same. Being an ISO 9001: 2000 and CMMi Level 3 certified company, and having worked with numerous Clients and successfully completing projects in India as well as in the Middle East, we have all the experience and expertise to meet and exceed Clients’ expectations and budget ensuring Quality Services.